If you are unsure if scuba diving is for you, a try dive may enable you to find out. In the safety of the pool you will be able to take your first breaths under water and we hope you find it a truly memorable experience. A one to one session with a Try Dive Leader will give you a basic introduction to diving at a rate you are comfortable with. A try dive may also a good way to refresh your memory if you are a qualified diver who has had a break from diving. You will be introduced to your experienced Try Dive Leader and there will be the opportunity to ask any questions and highlight concerns. Having been be fitted with mask and fins together with basic scuba equipment consisting of a buoyancy jacket and regulator attached to a cylinder containing air, you will be given a poolside explanation of the equipment, and shown some underwater hand signals and safety procedures in preparation for your dive. Entering the pool at the shallow end you will be introduced to some basic diving techniques. At all times you will be under the watchful supervision of the Try Dive Leader, and as you gain confidence you should find youself able to swim around comfortably under water using the scuba equipment. 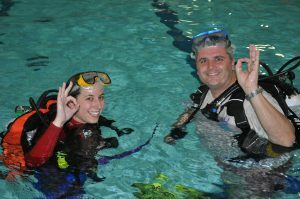 After the approximately 45 minute pool session you will receive a certificate showing you have complete a try dive and be invited to join us at the Sports Centre bar where we can explain more about the club and learning to scuba dive. A video of an actual try dive is shown below. It also gives an introduction to training with Bracknell Sub Aqua Club. It is worth watching because it may answer questions you may have. Who can do a try dive? All ages are welcome but participants must be able to stand comfortably in the 1.2m shallow end of the pool, and a parent or guardian must be present at poolside at all times for all try divers under the age of 18. Anyone doing a try dive should be able to swim 100 metres without the use of buoyancy aids. It is expected that participants consider themselves medically fit and do not suffer from any disqualifying conditions. The Try Dive Form covers this in more detail and needs to be completed prior to taking part in the try dive. Please read this form carefully and if in any doubt contact us before booking your try dive to discuss any issues. You can contact us by trydives@bracknellscuba.org.uk or 07951 855725 , and you can visit us at the club on a Thursday night. 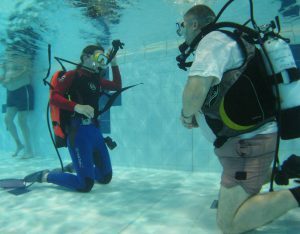 Your session costs £20 per person and all necessary scuba kit will be provided. Booking and payment should be in person on a club night at one week prior to your planned try dive. Email trydives@bracknellscuba.org.uk to let us know you are coming so we can ensure someone is there to meet you. Try dives are run on the first Thursday of each month but only by prior appointment from 8.30pm – 10.00pm at Bracknell Sports and Leisure Centre in the Training Pool. We do however reserve the right to restrict access to try dives depending on number of training courses being run in the pool and availability of Try Dive leaders. Please contact us for further information or to book a date (at least two weeks in advance) if you have a particular date in mind. trydives@bracknellscuba.org.uk or 07951 855725 . Full joining details will be confirmed after your booking. What to bring on the night? All you need is a swim wear but we additionally recommend bringing a T shirt for personal comfort. Although a mask and fins will be provided if you have your own you may prefer to use them. Similarly, although a wet suit is not required there is no problem if you wish to wear one. Every precaution will be taken or your personal safety during the try dive. Bracknell Branch organisers or individually appointed instructors reserve the right to terminate instruction of any person should there be reason to doubt fitness or ability or suitability to take part in the activity (a full refund will be given for any pre-paid gift vouchers in these circumstances). Video of a typical Try Dive with Bracknell Sub Aqua Club.